AFTER four decades the sound of bells will once more ring out from a church tower in Marston. St Nicholas the Wonderworker in Ferry Road, Oxford’s only Russian Orthodox Church, has finally had its new bells installed. Despite having a bell tower the church did not have planning permission to ring bells, but earlier this year Oxford City Council overturned that ruling and new bells have been hung just in time for Christmas. 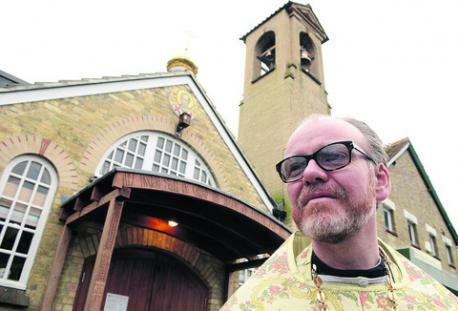 The church’s priest Father Stephen Platt said: “We are very pleased to have bells in our tower at last. “It has made a big difference to our parish. Every week around 60 people go to mass at St Nicholas, which opened in October last year. It was originally built as an Anglican church, which was also called St Nicholas, around 100 years ago. But after a name change to St Michael’s in the 1930s the church closed down in 1972 remaining empty apart from a brief period when it operated as a sign factory. The church’s bell tower was added in the 1930s but the bells that hung there are now in St Michael and All Angels in nearby Marston Road. After standing empty for nearly 40 years, the church building was reopened in 2010 after £250,000 of renovation work but city council planning officers did not allow St Nicholas to ring its bells when it first opened to avoid disturbing the neighbours. Last year, after the gift from Russia, Fr Platt attempted to get this ban overturned and asked the city council for planning permission to ring bells. When the church first proposed ringing bells from its tower there were complaints from some of its neighbours who said it would disturb the quiet area. Russian bells are different to English bells in that they are not swung, they are chimed and as a result are much quieter. The bells at St Nicholas, which range in size from 10in to 16in across, were hung by Whites of Appleton after being blessed during a special ceremony. According to the new planning permission, the bells of St Nicholas may be rung before church services on Saturdays at 5.30pm and Sundays at 10.30am as well as before weddings, funerals and feast days.